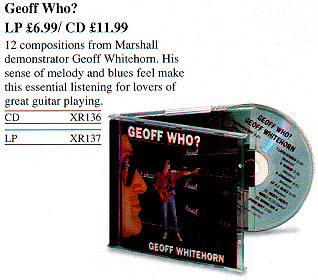 BtP contributor Dave Lee drew our attention to this reference to Geoff Whitehorn's solo recording career in the Marshall amplification 'Roadware Catalogue' from 1994. We were aware that Geoff demonstrated guitars and equipment for Marshall, but not that he had recorded for them at any stage. The above and its follow-up were among many recordings made for Guitarist, Guitar Technique, and a host of similar titles that used to be published by the Music Maker group of companies. In the mid-90s Music Maker were bought out by Future Publications, who were interested only in the magazines, not the group's peripheral products. We found out that Geoff had acquired his own CDs from the company, and had been sitting on them ever since: so we had no difficulty at all in getting Geoff Who? (1990) and Big in Gravesend (1994) added to the list of merchandise available from Shine On. 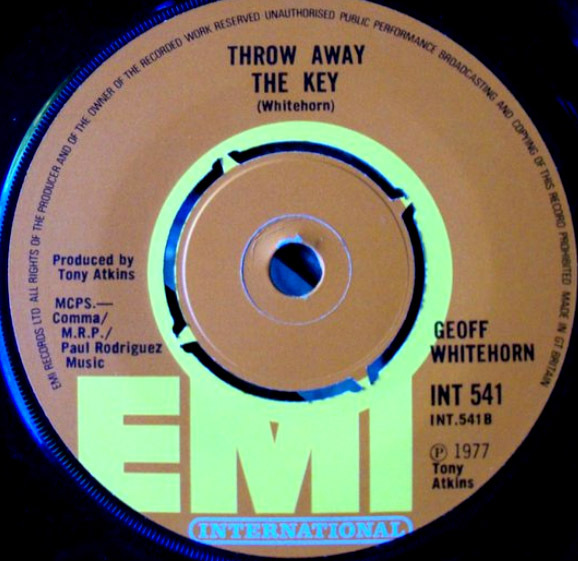 Later on we learnt that Geoff is now (1998) working on a third solo album in the series; and we learnt a little about his 'kinda crap' 1974 solo album, which was released in Japan, Germany and France. 2008 ... another solo album?